It’s an intrinsic idea of social media marketing that what can’t be measured isn’t worth doing. The next step on top of this, I guess, is that any metric that can’t be analyzed isn’t worth measuring. In this post, we’ll look at how hotel social media analytics should be at the core of your decision-making process. We’ll also investigate the tools that help sort through the noise and make these analytical insights available to your team. Using analytics is about collecting the right data. There is an art to applying the data to help meet your business’s goals. In social media, these are related but still very different terms. Hotel social media metrics are quantitative measures while analytics is about guiding strategic decisions. The number of followers who clicked on a link you shared on Twitter is a metric and assessment of what triggered that action and how many users ended up as customers is analytical. Generally speaking, analytics try to answer the why questions of which social media ideas have more utility than others and metrics handle all the other more nitty gritty what and when questions. Why do Social Media Analytics Matter to Hotels? “How can we do better?” and “should we continue with a particular social media marketing activity?” are the two principle questions we’ll answer in this guide to social media analytics. If you’ve built your boutique hotel marketing strategy and brought it to life with a marketing plan, analytics will be the key to adapting and refining it. With some expertise on how to use social media tools, we’ll gain a better sense of the marginal value of each new social media activity. I’ve heard it said that if the major social media networks were sports, Twitter would be baseball. Like a pitch, each tweet is an independent event that can be a hit that goes for a home run or it can just as easily be a swinging miss. And like baseball, Twitter presents many opportunities to measure and analyze numbers to find out what works best. Twitter has its own analytics tool. Putting ideas into practice is often the best way to visualize their impact and importance. 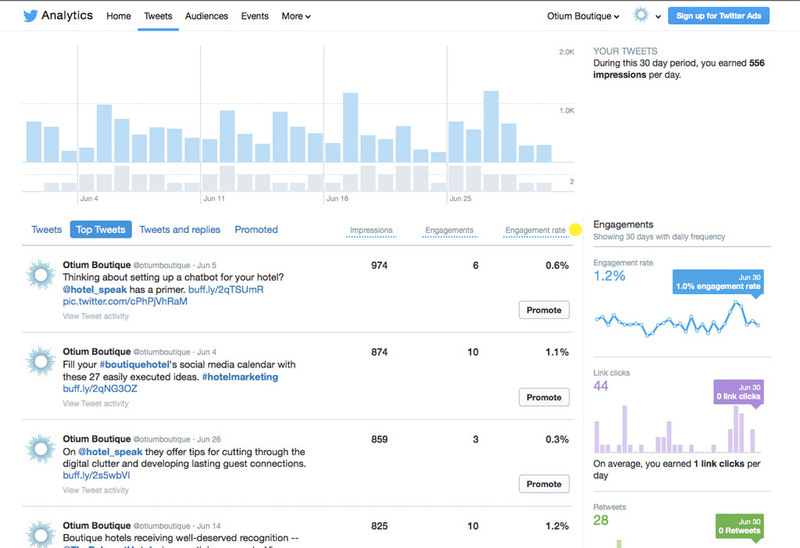 Here are three examples of Twitter analytics that relate directly to real-world success for hotels. Watch for seasonal correlation. You know when your hotel’s high season is and probably also have a good sense of when most guests are planning and booking for these lucrative dates. Under the Tweet tab, select the appropriate month, and use the Link clicks chart in the right sidebar to judge how well you’re using Twitter to direct interested leads to your site at the key times. Tie a surge in business to new followers. Maybe you know that the last week has brought in a few dozen first-time guests and would like to see how well you’re doing at retaining them for the future by encouraging them to follow you on Twitter. In the Audience tab, the top overview chart can help spot that type of surge in new followers. Custom date ranges aren’t allowed. You need to select the information in the Tweets tab either in 7- or 28-day windows or for a particular calendar month. The comparison chart in the Top Tweets sub-tab can only be sorted by impressions. You might want to know which tweet got the most engagement (likes, retweets, or clicks) or the highest engagement rate (engagements divided by impressions), but Twitter hasn’t made this possible. It misses the opportunity to present data visually. Other products have word clouds for most-used words or phrases and also present more information about which other Twitter users are important connections. In the Top Tweets tab, the Engagement Rate column can point to the best performing tweets. The Top Tweets tab will give a good sense of what is working well for your business. Twitter prefers to focus on impressions (and sorts the list by that metric) but because your hotel is trying to convince guests to make one, relatively large purchase, the engagement rate is probably more critical. Also, be sure to get a large enough sample because it’s easy to pay too much attention to a handful of top tweets in one month, when actually it’s better to base a template on, say, the top five from all of the last six months. Sometimes we get buried in the minutiae of day-to-day operation and forget that there are huge international events that have an outsized impact on attracting the attention of potential guests. Maybe your boutique hotel has a connection to cycling and it would be good to tailor your Twitter content to reflect that during the Tour de France or give followers a sense of your nerdier side during Comic-Con International. Both of these are highlighted (with plenty of advanced warning) in Twitter’s Events tab, so have a look here to help guide your long range planning. The Audiences tab will probably have some obvious information — I bet “premium brands” scores near the top of your Consumer buying styles chart and travel or hotels probably features in the top five for your followers’ interests — but these lists can have more useful insights further down. For instance, if “Ethnic explorers” or “Natural living” make an appearance on the chart, this could be a good secondary audience to keep in mind when planning your tweets. After Facebook stopped limiting its user base to university students, it had no distinguishing promise of purity the way Instagram holds onto artistic expression or Twitter maintains its 140-character limit. That meant that the doors were thrown open to businesses at an early stage and to keep attracting their ad dollars Facebook had to give them the numbers to prove return on investment. Facebook Insights is the name they gave their analytics suite (more recently Facebook launched a separate tool at analytics.facebook.com that is tailored more for iOS and Andoid app creators) and because of the head-start focusing on business users, it is very well developed. Access Insights by navigating to your hotel’s Facebook page and clicking on the Insights tab. There is lots to explore here, so let’s examine a few of the tools that will be relevant to hotel social media analytics. Look to the Actions on Page graph in Facebook Insights to see what followers are doing when they get to your page. Like other travel businesses, hotels often are marketing to a global audience in many times zones. Click on People (in the left sidebar) and have a look at the Times chart for information about when your followers are online (displayed according to your own computer’s current timezone.) This information, combined with the knowledge that a Facebook post does best in its first 4 – 6 hours should guide your posting schedule. The Actions on Page will give a sense of how followers are trying to find your hotel — website, phone number, or by clicking for directions — and by analyzing these relative preferences you can direct resources and spot potential weak spots. You can go as far as to see specific demographic info like the country of those who clicked your phone and therefore decide on offering toll-free service or selecting phone operators based on their language proficiency. Sure, Page Followers is a vanity metric, but within the Followers tab, the Net Followers chart can definitely be useful. Watch out for a spike in unfollows relative to new followers as an indication that you may be aggravating part of your audience with the content you share. Spot how well your hotel’s page likes campaign is doing by comparing the “paid” and “organic” parts of this graph. The reach vs. spend on promoted posts. If you are spending money to boost a post and reach a larger audience, you want your People Reached number (within Facebook Insights click the Promotions tab) to be as high as possible. Watch how widely the reach can vary — usually because someone engaged with a paid post, for instance by sharing it, and that triggered a greater organic reach — and strive to replicate what works. In the Net Likes chart again, you can see how well your hotel’s paid campaign for new followers is working and judge when it is time to turn it off and let organic growth do all of the work. Facebook is out ahead of other channels when it comes to letting advertisers track offline conversions. Maybe a future guest sees your promoted post on Facebook, but instead of clicking through and booking directly through your website they pick up the phone and call to book. It may be possible to connect the Facebook API to your booking system to properly attribute this result to the ad campaign. Likewise, current guests will probably complete several transactions (e.g., at your restaurant or spa) during their stay and you’ll want to let your Facebook ad account know about this spending behavior. With this offline conversion data properly analyzed, your hotel can design campaigns for lookalike audiences and retarget past guests with ads that encourage repeat business. Helping Google Analytics attribute certain clicks (and therefore website visitors) to a particular campaign. For instance, you might append the campaign name parameter fb-black-friday for the Black Friday room sale campaign you run on Facebook. This allows you tie the results (direct bookings) to the paid Facebook advertising. On their blog, MarketingLand has a very thorough guide to using UTM parameters. Have a look once you’re ready to jump into the deep end. Another way to build in-depth analytics on what users do after seeing your Facebook ads is the Facebook Pixel. It’s a small piece of code you place on your website that fires a script when it loads that helps identify who comes to your site and what they do once there. Find out what users search for once they land on your hotel’s site. This way you can better match your customer-facing content to their needs. Remarket to those who abandon a booking part-way through the process — even if they change to another device. Build custom audiences of your website visitors for future direct targeting of ads or to create Lookalike audiences that can help your marketing messages reach a broader group who have lots in common with your past website visitors. Observing the path from Instagram website link to direct bookings. “Link in bio” is a popular call-to-action made necessary by Instagram’s rule against links within posts. Instagram Insights lets businesses see how often followers have followed through. Tools like Google Analytics can help track what happened after the initial click-through. Tracking views for Instagram Stories. Like Snapchat that “inspired” the format, Instagram Stories are both ephemeral and self-contained (except for the ability to mention another user) so brand visibility has to be their primary objective. It is a great venue for hotels to give followers a glimpse of the lifestyle offered at your destination, but you want to use analytics to make sure you are actually reaching an audience. Placing your Instagram audience in a broader context. Demographically speaking, who follows you on Instagram vs. the other networks? By following the “See More…” link in the Followers box, Instagram Insights will show you how your hotel’s follower break down by age, gender, and location. Analyze this data against what you’ve gleaned from other channels to guide how you tailor your messages. 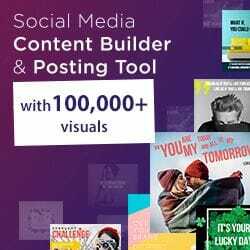 Social Media Examiner opens their roundup of Instagram analytics tools with a good, general primer on Instagram Insights. What Other Hotel Social Media Analytics Tools Are Available? The built-in social media analytics dashboards are a good place to start and in many respects offer robust insights that will help guide how you evaluate your hotel’s social media activities. At a certain point, you may want more advanced or automatic analytics reporting and there are a few tiers of third-party tools on the market. Sites like Simply Measured can offer some fairly in-depth reports for free (even if the interface is quite limited). Tools like Hootsuite, Buffer for Business, Sprout Social, and Audiense can help you dig deeper into analytics. Generally, they also have some combination of scheduling, approval, brand monitoring, and follower interaction functionality to go with the analytics. Just like other steps in the social media marketing process, a solid grasp of the basics is an important foundation for deciding what will make a positive difference for your hotel. 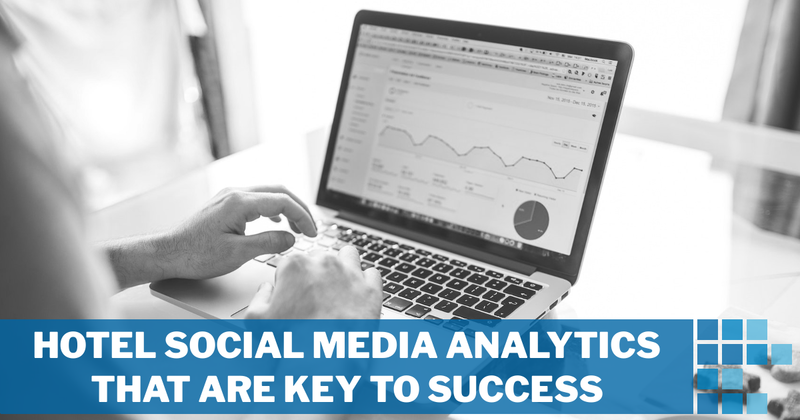 At more advanced levels it usually makes sense to call on the expertise of those who dig into social media analytics on a daily basis. At Otium Boutique, we make reporting and analysis a core part of every boutique hotel marketing plan we help our clients execute on. Send us a note and let’s figure out how we can help achieve your hotel’s goals.